Many plastic cards, such as credit cards, have a strip of material that can be magnetised on the back. Data can be stored here in the form ofmagnetised dots. Usually the data stored on this strip in the same data shown on the front of the card (e.g. the credit card number, expiry date and customer name). The stripe allows this data to be input to a computer system faster andmore accurately than by typing it in. 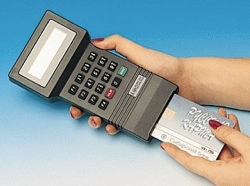 A magnetic strip/stripe reader is used to read the data from the stripe. This is usually done by ‘swiping’ the card through a slot on the reader. Data can be stored in this memory and read back using a ‘chip’ reader. 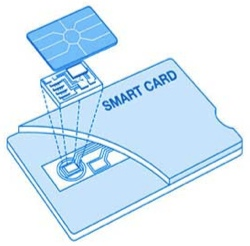 A card is inserted into the reader where metal contacts connect to themetal pads on the front face of the card. The reader can then access the memory chip and the data stored on it. Smart cards can store much more data than magnetic strip cards, e.g. an ID smart card would store not only the owner’s name and card number, but might also have a digital image of the person. 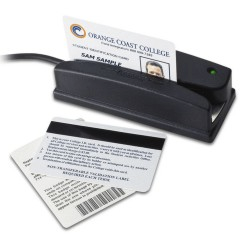 Many types of card use this system: id cards, phone cards, credit cards,door security cards, etc.